Did you know that pumpkin seeds are incredibly healthy? They are terrific sources of heart healthy magnesium, zinc, which is not only great for your immune system but great for your skin, and fiber. I loved carving pumpkins as a kid (okay as an adult, too), but all too frequently we would toss the seeds into the garbage with the rest of the guts! I didn’t think that cleaning the seeds and roasting them would be worth all the effort when I could just go to the store and buy a bag. I was wrong. Yeah, they take a bit of work to clean and then time to roast but OMG. Delicious. They are now one of my favorite fall treats! Clean the seeds of any pumpkin guts! No orange on these babies! Boil for 10 minutes in salt water (1tsp salt). This extra step creates a crispy outer shell. Season ‘em. Spread seeds on baking sheet and drizzle with extra virgin olive oil. You can cheat here and use a spray as well. I think it gets the job done easier and you end up using less oil (unless you get trigger happy!). Sprinkle with sea salt . Roast ‘em. Place baking sheet in the oven at 300F for 15 minutes, then remove and shake/toss seeds and continue roasting for 10-15 more minutes. Be careful not to burn the seeds! They are done when they have a nice golden color! Now if you want to try other yummy spices, complete the first two steps (boil, drain & dry). THEN roast at 300 for 15 minutes to dry them. Toss seeds with olive oil, sea salt and spices, then return to oven and roast for 15-20 additional minutes until crispy/golden. Come on everyone- we’ve all been there. At one time or another, all of us have wanted to be celiac free and not give as much thought to what we eat like we have been trained to do. We have all come to the point where we substitute our breads, pastas, cookies and pizzas with ease. We are all guilty of having that momentary excitement when we find one of our “old standbys” now have a gluten free version. I’ll admit it, I was pretty excited when I found that my local grocery store carried gluten free cupcakes on a regular basis- and they were tasty! When I was first diagnosed with celiac disease I was not underweight at all, in fact, when I went gluten free I managed to LOSE weight. Now as I learned to master the gluten free world the pounds starting to sneak back on- and on, and on. I was a master of reading labels. I knew everything in my food to the point of obsession at times. However, while becoming the incredible gluten detecting machine I can be, I managed to overlook a vital part of food labels. Mainly calories, fat, and carbs- you know, the ones that fed my waistline to the point of being overweight. The scary part, though, is that this is pretty much the norm for most of the celiac community. Yikes! Time to get ourselves back in check! 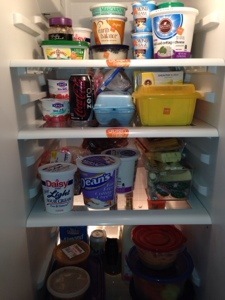 Second, I needed to learn to navigate those food labels again. I had become so intent of finding the gluten on the label that I developed tunnel vision! The other difference that we all have to watch out for in gluten free food is right there! Gluten free food usually requires “a little extra” added to them to make up for their glutenless existence. Sometimes it can be extra butter or sugar for texture and/or flavor. You know what that means, right? Extra calories and fat. In fact, it’s well known that gluten free foods tend to be higher in calories and fat than their gluten containing counterparts. So this adds to my dilemma- to fake it or not? My own opinion is that most of the time, faking it just isn’t worth it the majority of the time. I’m going to stick with my bunless burgers, my lettuce wrap sandwiches, and I’ll probably skip the cookies most of the time, too. For me, I’d rather save my calories for something else- like those cupcakes! Anyone with celiac can relate to the awful moment when some gluten has managed to get past their lips. For me, those have always included being pretty angry and disappointed in myself. I would think: I’m never going to figure out this diet. I don’t want to go out to eat anymore. I don’t trust anyone with preparing my food except myself and, honestly, sometimes I didn’t even trust myself. After about 5 years of the diet I think I have finally gotten the hang of it. While I know its bad to cheat on the GFD, I will be honest and say I have done it in the past. Is it worth it? Nope. Seriously- the food wasn’t as good as I thought it would be and I would be sick for days! Plus, there’s always the long term consequences associated with NOT following the GFD! I don’t know about you, but infertility, osteoporosis and CANCER do not sound like a great trade off for that pizza or cookie! So for the first few months I would CONSTANTLY beat myself up about my mistakes. It made the processes pretty miserable for myself. I now know much better and give myself some slack. When I talk to people who are new to the diet, I try to warn them that mistakes are bound to happen. It’s a part of life and you just need to quickly identify your source and get rid of it. 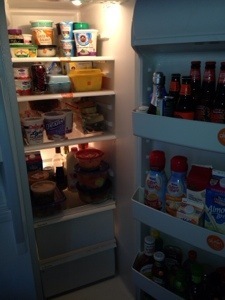 I can’t tell you how many times I have taken everything out of my refrigerator or my cabinets and gone over every label. EVERY SINGLE LABEL. It may sound like an overkill, but hey, sometimes the ingredients change! The reason I decided to take a moment and post this is because I’m sure there are many other celiacs out there that have had to deal with accidental ingestion. It’s frustrating, but it happens to the best of us! None of us are perfect no matter how hard we try. 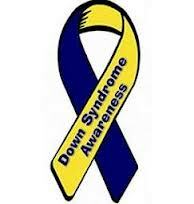 Did you know that October is National Down Syndrome Awareness Month? Did you also know that children with Down Syndrome are more likely to develop celiac disease than other children? According to some studies, the number can be as high as 10%, compared to 0.7% of the general population. That’s a huge deal! Children (and adults) with Down Syndome are at a higher risk of autoimmune disorders, the two most common being hypothyroid disease and celiac disease. In autoimmune diseases, your body gets its signals crossed and takes its aggravation out on itself. Yup- your body basically attacks, well- your body. In celiac disease, antibodies are made when we ingest gluten. They then turn and begin attacking the small intestine and prevent our bodies from absorbing important nutrients. The only way to prevent this from happening is by following the gluten free diet. Now, while celiac disease is definitely addressed more frequently now by doctors, it may not be one of the first things they think about in their patients with Down Syndrome. My point? Well, sometimes parents need to be their children’s advocate, even with their pediatrician. So, if you’re concerned that your child may have signs or symptoms of celiac disease, bring it up at your next appointment! You may be right.